Find out how creative entrepreneurs turned unusual spaces into the perfect location for their business. What would you see if you came upon an abandoned church, the parking lot strewn with weeds? You may have a fantastic imagination, but you probably wouldn't envision an authentic Viking inn . But that's what Steinarr the Kraze E. Viking (formerly Richard Schimidthuber) saw, and with a leap of faith, a large supply of creativity and several months of hard work, he turned a shuttered church into the business of his dreams. Entrepreneurs are oozing with creativity, hard work and chutzpah, but it takes a special kind of vision to see a brand new business thriving in an old church, school, racquetball club, greenhouse complex or even an early 20th century poorhouse. For Steinarr, a need to start over and a love of all things Viking led him to return to his home state of Minnesota in 1996 from California, where he'd been a metrologist at a biotech company. "Driving around, I ran into this church. There was no 'for sale' sign. There were weeds growing around it," recalls Steinarr of the former Methodist church in Crosby, Minnesota. "So I went to the city hall and asked who owned this church. Within five minutes [of meeting the owner,] we had struck up a deal." Scarlett and Nancy Foster-Moss had a similar brush with real-estate fate. They weren't in the market for a business; they were just looking for a place to live outside Seattle when they came upon an internet ad for the Beall Greenhouses, a 17-acre spread with 57 greenhouses on Vashon Island, Washington. Built in the 1880s, it was once the West Coast's largest rose and orchid production location. The property already had some art studios on it and a barn converted into a house, but the majority of the greenhouses had reverted to nature with "alder trees and blackberry bushes growing inside and out through the glass roofs," says Scarlett. In the four years since purchasing the property, the partners have converted several buildings and a greenhouse into more studios, and they now have 16 tenants in their art compound. "We live on an island and both work off-island, so time is always a challenge," says Nancy, who is now transitioning to part-time freelance work so she can be on the property more often. "There are a limited number of people doing the things we need to get done on the island, so getting time scheduled [with contractors] or getting people to come to the island by ferry [can be difficult]." Fortunately, there's no shortage of artists on the island, so they have a waiting list of people looking for space. Steinarr had his share of growing pains as well. He had a heck of a time getting approval for his "medieval brew and bed" from the city, as some residents were "afraid of what they don't understand and don't like change." After two petitions--one pro, one con--and four town meetings, he prevailed, opting to have his nightly feasts catered since he couldn't get the food and liquor license he desired. He spent six months renovating the property. "Everything had to be custom made. So it was a flurry," says Steinarr, whose mother helped by constructing shields and leather hangings. Steinarr, a self-taught leatherworker, now runs a side business, " Viking Vear ," creating leather Viking costumes and drinking horns. A year after opening--and garnering a slew of publicity for his unique inn--he finally received his liquor license. Today, he offers guests a bevy of entertainment, including Viking-inspired games, a dinner mystery and a dinner theater. 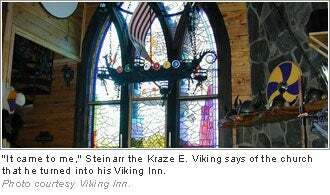 Steinarr is the still the inn's sole employee, meaning he's the Viking who demands a password when guests arrive at the inn and pull the chain to sound the alphorn. When Paul Kolada's industrial design firm, Priority Designs , quickly outgrew the rented industrial park space it was founded in, a former racquetball facility in Columbus, Ohio, proved the perfect new space. "It was a distressed property, a sheriff's sale," says Kolada. "It smelled of chlorine and sweat. It was mal maintained. But in general, it was a solid building [with] a number of wide open spaces." Kolada had the HVAC systems refurbished, and added new lighting, walls and conference rooms to the space. A pool in a side building was filled in to create a prototype lab. Kolada offset the property investment and renovation costs with tenants in half of the 32,000-square-foot property. Kolada kept one racquetball court for employees. Recently, Priority Designs underwent a second renovation. "We were a 15-man firm, and our finances and sensibility were what they needed to be [with the first renovation]. Now we're about 50-people strong, and I have a lot more resources," says Kolada, who runs the company with his wife, Lois. The company now occupies about three-fourths of the building and has added new studios, conference room spaces and amenities, as well as a materials library and a brainstorming center. Another new feature is a rock-climbing wall for some of the more vertically inspired designers at the firm. Brothers Mike and Brian McMenamin have created a successful Pacific Northwest business by turning old and interesting properties into pubs, movie theaters and hotels. Starting in 1983 with a single pub, the brothers now have 54 locations with 2,000 employees, but they still strive to save and refurbish unusual locations. They undertook their first major renovation in 1990, when they turned the former Multnomah County Poor Farm into Edgefield, a lush hotel with a restaurant, pub, movie theater, on-site artists and numerous other diversions. The McMenamins headquarters in Portland, Oregon, are housed in an old mortuary. They've put a pub in an old Masonic hall, and have turned more than one school into a hotel. "Classrooms are perfect for breaking up and making bedrooms," says Brian. "I think people really enjoy the whole idea--smoking and drinking and sleeping in class. They get kind of pumped up about it." The company is currently planning to take over the food and beverage section of a golf course, which will be housed in a 70-year-old building. The brothers have used the same contracting firm for their renovation work for more than 20 years. "We like the old buildings because they have a good history," says Brian. "It gives it that fourth dimension for us. We have pubs in new buildings, but it's just hard to give it personality when you do that. It's more fun to use the history of a [property] to give it something that people can get their hands around."